“Winning without counting the costs” well summed up the cultural mess at Cricket Australia. The independent review of the sporting code held a mirror up to Cricket Australia and asked a question pertinent to all professional sports in Australia; what values should our sporting codes represent? In their pursuit of the easy dollar, Cricket Australia, along with the nation’s other major sporting codes – namely the NRL and AFL – have stuffed every corner of their respective sports with alcohol and gambling advertisements. Sports and sports stars have become the ambassadors for booze, greed and suffering. They expose millions of impressionable young children to incessant alcohol advertising; advertising that is proven to increase their risk of drinking earlier and at harmful levels. Unfortunately, children are just collateral damage when a sporting code focusses only on profits and is no longer counting the costs. But it’s wrong and it has to stop. Hopefully, this review is looked back on as the turning point for professional sports, when communities demand that the sport they love, represent something worthier than alcohol ads and corporate greed. Because when it doesn’t, well you’ve seen results. 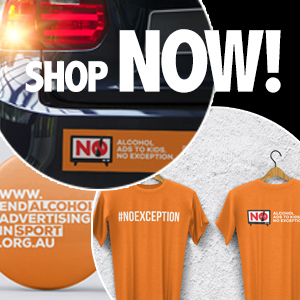 If you’d like to see an end to alcohol advertising in sport, we urge you to join our campaign today. Today on Drink Tank, Steve Georgakis, is a Senior Lecturer of Pedagogy and Sports Studies at the University of Sydney says Cricket Australia needs to work with commercial partners, or abandon them if they can’t meet high ethical standards too. This post was first published on The Conversation.